I am all for self-sufficiency. I am a champion of self help in making a better future you and your family if you don’t impinge on my ability to do the same. I do not believe anyone, including the federal government, should be in your way of success. I also believe the government should be able to help those in need. President Johnson proposed “The Great Society” as policy initiatives with the main goals of ending poverty, reducing crime, abolishing inequality and improving the environment. The Office of Economic Opportunity and the Economic Opportunity Act were created to help the poor break the poverty cycle. This leads us to ask, is there a goal to dismantle HUD and any other federal social reform act? Is there a war on the poor? I think there is, and I believe Dr. Ben Carson is the face of this war without him knowing it. He believes the war is not on poverty but a war on mismanagement of the funding the Federal government provides. Dr. Carson is the same person whose office purchased $30,000 dining room set that he says he did not know about. 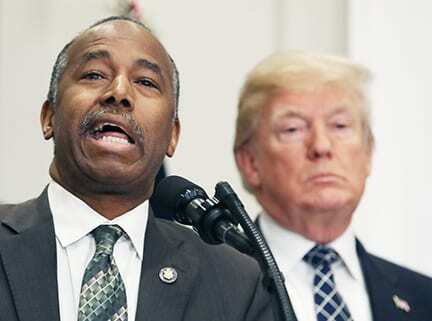 Under his leadership, the new Fiscal Year 2019 budget proposal calls for HUD funding cuts of $8.8 billion. This is a prime example of the incompetence of this administration. Yes, the president is drawing attention for his many pardons and the meetings with North Korean leaders. Meanwhile members of his administration are trying to kill the hopes and dreams of those who need help. This is not sustainable. There are many examples of the war on the poor. Dr. Carson is blocking and not enforcing the “Small Area Fair Market Rent” rule. The rule was intended to increase voucher households access to apartments in areas of greater opportunity. Dr Carson also wants to raise the rents up to 35% on people in public housing. The administration also calls for a 14.2% decrease to various rental programs like Section 8. More and more people are falling further and further behind. But rather than expanding these safety net programs, the administration is reducing these programs. Dr. Carson also wants to shut down any access for the poor to any social programs. This is done as if people are comfortable in poverty. Since when has it become better to get rid of programs to help all people? This administration fails to see helping the poor helps us all. I encourage everyone to pull themselves up by their bootstraps to become successful. However, what do you do when you have no boots? Investing in education, head start programs, and food vouchers help improve health, cut crime and increase the country’s security far better than building an ineffective wall. We must put pressure on our leaders to protect these programs and expand the opportunity for all rather than just the rich.